The above info came from atomofish, and was edited by yours truly (contact me). Darling in the Franxx takes place in a post-apocalyptic future where Earth has been invaded by strange beings named Klaxosaurs. Pushing humanity to the brink of annihilation. 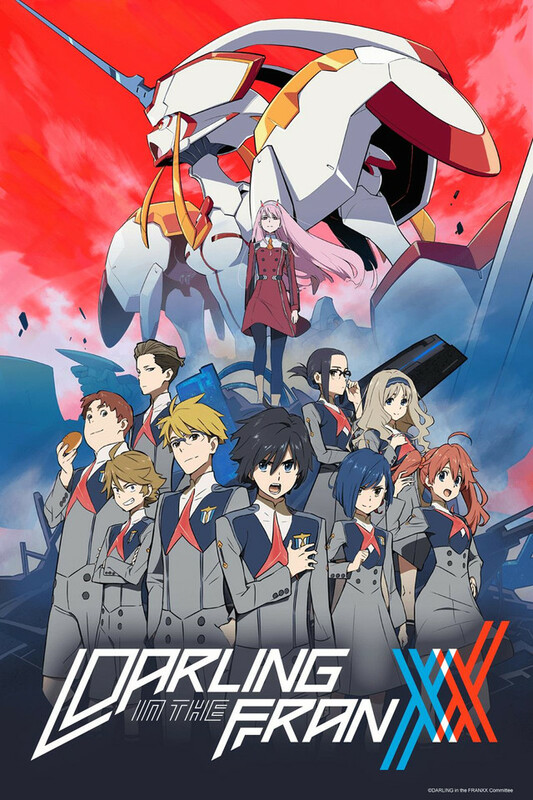 As the people of Earth fight for survival, civilization is now separated into separated cities known as Plantations, where children are bred and grown to become pilots of the Franxx, giant robots that are humanity's best weapon against the Klaxosaurs. They are guided by APE, an organization that took charge of civilization in the wake of the alien invasion. Hiro, a boy who hopes to become a Franxx pilot, has unfortunately failed the training program he needs to go into action. His destiny changes when he meets a strange girl named Zero Two, who has a dark history involving the Franxx. She has a history of having all of her previous partners die in battle, which creates superstition among their peers. She takes an immediate interest in Hiro, and proves a capable partner in battle after the latest Klaxosaur attack. Ignoring all of this, Hiro decides to become her partner against all odds. Will these two become humanity's greatest hope, and will Hiro be the one to break the curse?